Like I mentioned in my Black Friday post, I know many of you are planning to shop online throughout the holidays. 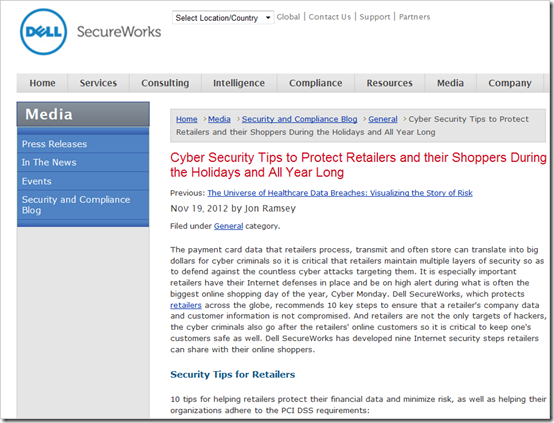 Dell SecureWorks helps many retailers secure their websites for the rush of online shopping that tends to happen this time of year, so it makes sense that they know a thing or two about what to look out for for both retailers and online shoppers. That’s why I think it’s worth a few minutes of your time to check out a recent blog post from Dell SecureWorks CTO Jon Ramsey over on the Dell SecureWorks blog.